Hand carved wooden snuff bottle portable with spoon snuff necklace with small funnel. ◆MATERIAL: Snuff bottle is a natural wood products, exquisite gift for family or friend. ◆SNUFF BOTTLE: High quality wood, hand made, polished, retain natural texture, the details of the handling of rich and delicate. Hand carved wooden snuff bottle portable with spoon snuff necklace with small funnel. ◆SNUFF BOTTLE: High quality wood, hand made, polished, retain natural texture, the details of the handling of rich and delicate. 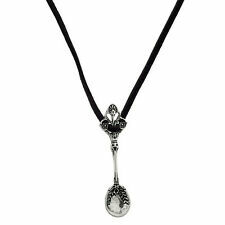 The bail unscrews to reveal a tiny snuff spoon discreetly concealed inside the pendant when worn as a necklace. Can be used to keep snuff, pill powders, herbs, essential oils etc. Your own little secret stash locket with a hidden chamber! Gorgeous Handmade Custom Stash Necklace Pendant ! I tested it with salt and it's able fill 2/3rd full with the spoon inside, which I estimate to be about 1000mg of powder or 10 small 100mg pills(opened). Antique Burnished Spoon Pendant Necklace Mini Tea Snuff Spoonful. Main Stone Ring Size Main Color:Silver. Too cute not to buy! A charming miniature snuff spoon, or salt, spice spoon or whatever. Victorian in design, sturdy and solid in manufacture, Useful and attractive in form & function. And. separate from the charm necklace you are buying. We also include this free golden gift box! HO RNET Luxury Necklace Cr o wn M etal Snuff S norter Spoon. Main Stone Ring Size Hair Accessories. Main Color: Gold. This is a sandalwood hard wood snuff bottle, capacity is 3g. 3-5 gram size bottle, made of dark or light brown Sandalwood Ebony (outside) and brass (inside), with brass spoon lid. Material: sandalwood, brass. Size:Total length 60cm, Extension chain 5cm, Spoon 6cm. Appearance and Shape makes it looks like a fashion and elegant decoration. Snuff spoons, or small decorative spoons used for nasal ingestion (insufflating) of powders have been around for hundreds of years. Having been found, showing traces of having been used for powder inhalation, in a collective burial chamber in Nino Korin, Bolivia, with the grave sites being carbon dated to AD 335, 375 and 1120. Style Aunk double snuff spoon.